This downstairs unit is perfectly located on the first tee of the Fazio Golf course a stone's throw away from delectable Lei Lei's Restaurant. Downstairs you will find 2 twin beds with an air conditioner in the bedroom. Just outside the bedroom is the bathroom. 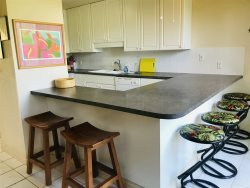 The kitchen and dining area are clean and comfortable. The living area leads to the lanai where you can watch the excitement of the beautifully maintained Fazio Golf course. Upstairs is a loft bedroom with 2 twin beds and a bedroom with a king bed and bathroom. ** This is our budget unit. It is cleaned well but could use upgrades of bathrooms and appliances. Everything is in working order.